Abstract: Evolution drives, and is driven by, demography. A genotype moulds its phenotype’s age patterns of mortality and fertility in an environment; these two patterns in turn determine the genotype’s fitness in that environment. Hence, to understand the evolution of ageing, age patterns of mortality and reproduction need to be compared for species across the tree of life. However, few studies have done so and only for a limited range of taxa. Here we contrast standardized patterns over age for 11 mammals, 12 other vertebrates, 10 invertebrates, 12 vascular plants and a green alga. 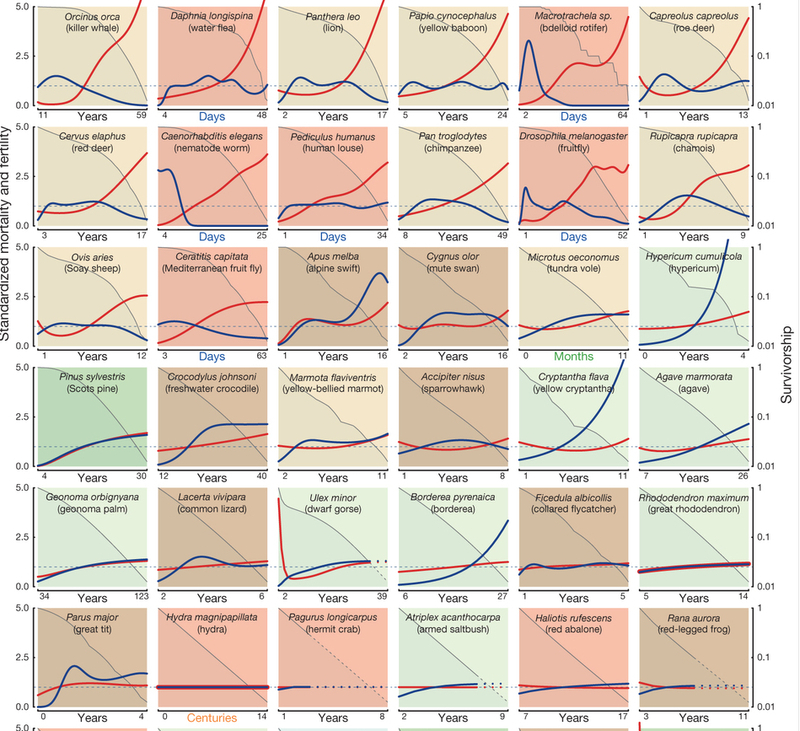 Although it has been predicted that evolution should inevitably lead to increasing mortality and declining fertility with age after maturity, there is great variation among these species, including increasing, constant, decreasing, humped and bowed trajectories for both long- and short-lived species. This diversity challenges theoreticians to develop broader perspectives on the evolution of ageing and empiricists to study the demography of more species.